On a recent outing with a family member, running my fingers across the blue steel of the Tower Bridge, we stopped. And looking out towards Southwark, he pointed at a row of Victorian warehouses turned luxury flats. In between the long windows and black balconies, before one set of extortionate accommodation turned into another was a dark street narrow enough to be an alleyway. "That," he said, "Is where Fagin's Lair really was". He wasn't right, but it wasn't hard to believe. London is the metropolitan capital of England. 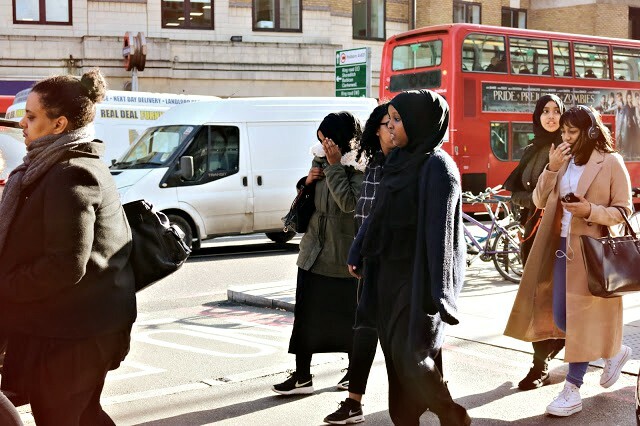 It's loved and celebrated by locals and tourists alike, and it has been since the days when Charles Dickens wrote Oliver Twist. What is often criminally underrated about the City is the charming contrast between just how much has changed, and how much has stayed the same. You can pick up any Dickens book set in London and still, to this day, follow his characters step by step around the streets. As a matter of fact, I could quite easily make a series of posts as long and epic as David Copperfield on London's surviving links to Dickens alone. 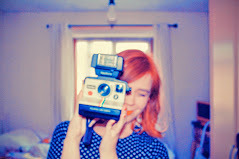 So when I saw that Accor Hotels was hosting another amazing competition, I knew I wanted to do something different. 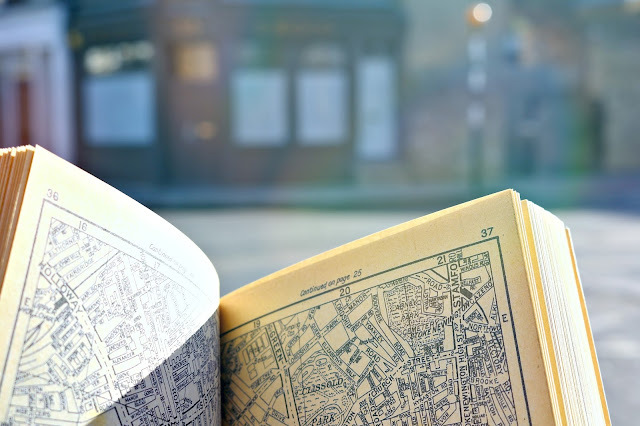 I grabbed my copy of Oliver Twist, my vintage A-Z and set off on a journey, following a cast of Dickens' most notorious characters from Islington, to Fagin's Lair and the home of the infamous Bill Sykes in one 24 hour trip. Our story begins on Cleveland Street, long before Oliver Twist had even entered the mind of Charles Dickens. It is on this street that, amongst the hustle and bustle of the University of Westminister and under the shadow of the BT Tower, the inconspicuous, grade II listed 'Strand Union' workhouse still stands. Workhouses played a huge role in Dickens' life and literature, and, despite the fact the 'Strand Union' came under threat from demolition in 2011, it is now widely accepted that this is where his obsession began. Dickens lived at number 22, just three doors down from this particular workhouse for a hefty six years of his life. Three as a child, and three after he began working as a newspaper reporter at 17. Built in 1775 under the old 'poor laws', there have been some new additions to the building, and some restoration over the years, but it remains largely the same as it did in the years Oliver Twist was set. There's no doubt that this site, so close to his childhood home, had a huge impact on his later writings. Of course, Oliver's connection with London begins on Barnet High Street, now all the way out in Zone 5 of the London Underground. This is where the Artful Dodger and Oliver Twist first meet. 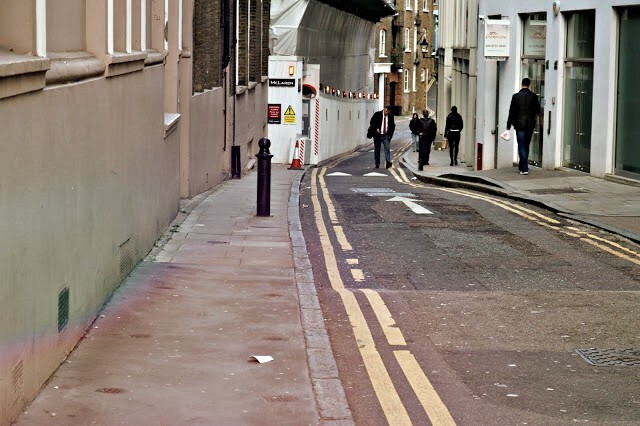 From this street, they walk to Fagin's Lair and, due to the wonderful imagination and descriptions of Dickens' books, it is a route that can still be followed almost step by step. The reader's real introduction to London is on Liverpool Road. On its corner with Bachelor Street stands the site of the former Agricultural Hall and Islington Turnpike, one of the first landmarks mentioned in the book. 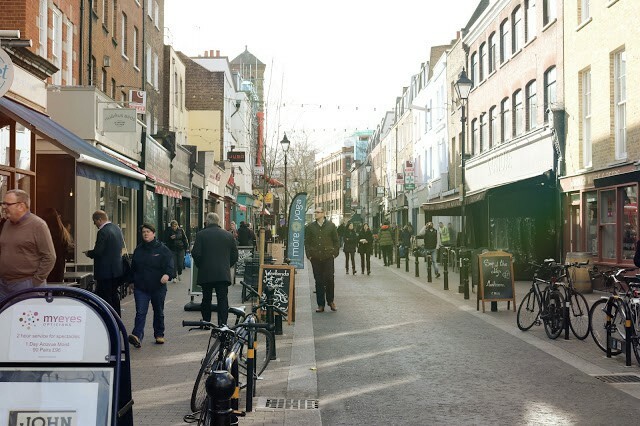 Islington High Street has been a significant area for travellers since London's medieval days, and it's almost bursting with hidden history. Now a busy Intersection, Islington Turnpike was built in 1716 after the foundation of the Islington Turnpike Trust. It stood roughly where the White Lion Street now meets the High Street. This is where tolls were collected, and weary travellers would rest on their way into the city amongst Islington and Clerkenwell's well-renowned inns. 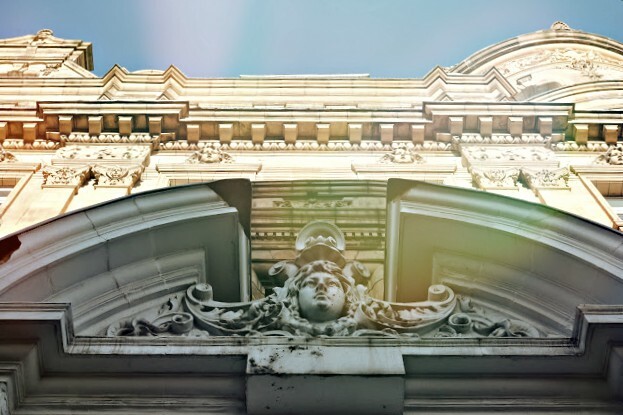 One of the most significant buildings was The Angel, now a Co-Op Bank. Some of its grand facades still remain. Considered the last great coaching inn of the Great North Road, it was rebuilt in 1819 and later converted into a hotel when railways depleted the need for coaching inns. The Angel sits just ahead of St John Street; one of the most important streets in London's history. 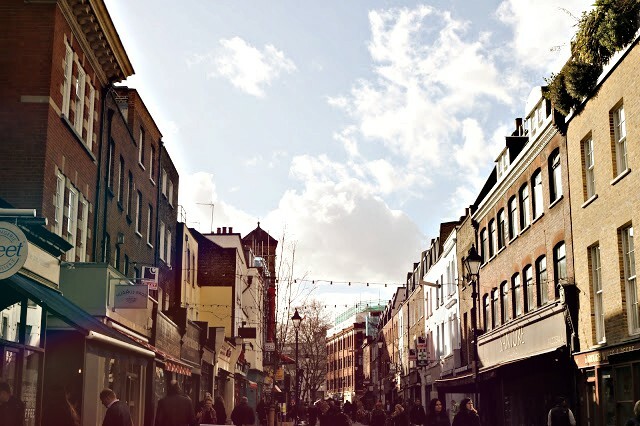 St John Street is mentioned in official documents dating back to 1115 and was famously lined with taverns. Old Red Lion is the last remaining one and was rebuilt in 1899; replacing the original Inn that dated back to 1415. It's clear Dickens wanted to show the reader, through Oliver's eyes, one of the most historically important and interesting routes into the city of London. So, here, we begin to enter Clerkenwell. 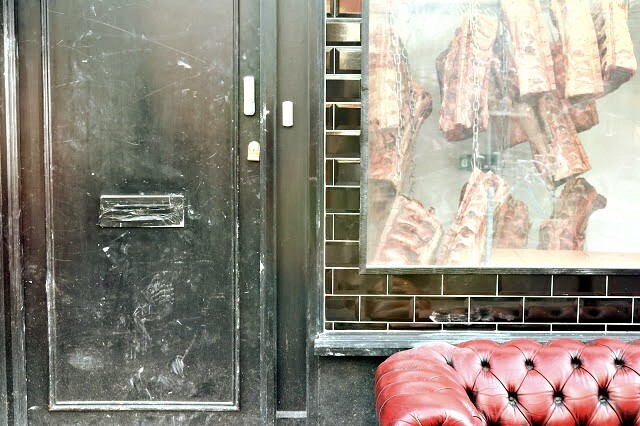 Clerkenwell gets its strange name from the Clerk's Well on Farringdon Lane; parts of which can still be seen through the window of the Well Court. In the Medieval Ages, this was where local Parish Clerks performed annual mystery plays. Another significant street in this area is Arlington Way. Now mostly residential houses, there are two buildings that quite obviously stand out; numbers 27 & 28. The Harlequin - established in 1848 - houses a memorial to Joseph Grimaldi inside. Grimaldi was the most popular English entertainer of his time, often working as a Clown. Dickens watched Grimaldi perform in London as a child. Later, they became close friends and Dickens even helped write his memoir after Grimaldi passed away. In the 19th century, all the houses on this street had the same front, but, unfortunately, only two now remain. It's also worth taking a small detour through Spa Field's Park, which brings you out onto our next destination. Under this site was where the Clerkenwell Detention Centre Stood. The underground chambers are still beneath the park. Next is Rosebery Avenue. Built in 1899 by Lord Rosebery, it was designed to outprice the back alley slums that used to exist there, and where Oliver and Dodger would have tread. In the book, Oliver notes these streets end at the Sadler's Well theatre; where Joseph Grimaldi often performed. The cheap plays put on in this area, aimed at entertaining the poorer members of society, hugely influenced Dickens' writing. Down a couple more streets, and close to the Round Pond where the fresh water man-made New River ended lies Exmouth Street & Marker. The New River was built in 1607 by Sir Hugh Myddleton as a conduit and it aimed to bring fresh water into the city. It flowed through a man-made channel at the Round Pond and then through wooden pipes into houses but was abandoned in 1946. Opposite Exmouth Street was Coldbath Fields Prison. It was the largest in the country at the time, holding 1800 prisoners, and was closed in 1877. Coldbath was also known for its experimental treatments, including the treadmill and the silent system. Mount Pleasant would later be built there, and this building was used as the rather ironically named home of the Smallweed family in Bleak House. Dickens was also good friends with a famous prison reformist, George Chesterton. Chesterton allowed Dickens to see the treadmills in person and write about them in his non-fiction essays. However, despite being able to witness the prison's holdings, Dickens did not feature it in his writing as heavily as Newgate and Marshalsea; he didn't believe that the treadmill would hold the interest of the people as steadfastly as the gallows. The next significant site is Farringdon Road. Constructed in the mid-1800s, like Rosebery avenue, it was intended to steamroll the slums that used to exist there. Its building displaced over 16000 individuals who were not rehomed. On this site were three infamous slums - destroyed to make way for the new road- Coppice Row, Chick Lane, and Field Lane. 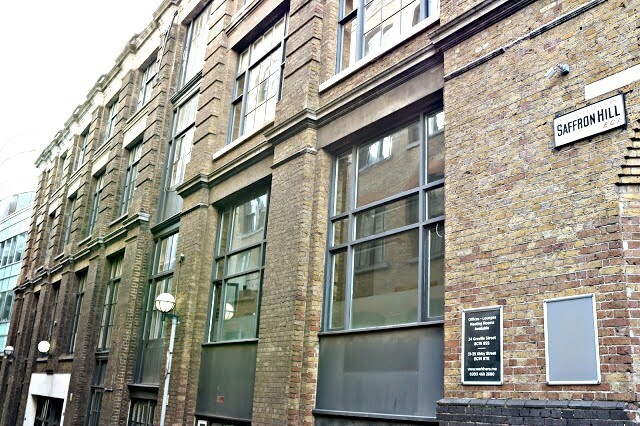 This is where the infamous Clerkenwell Workhouse existed. 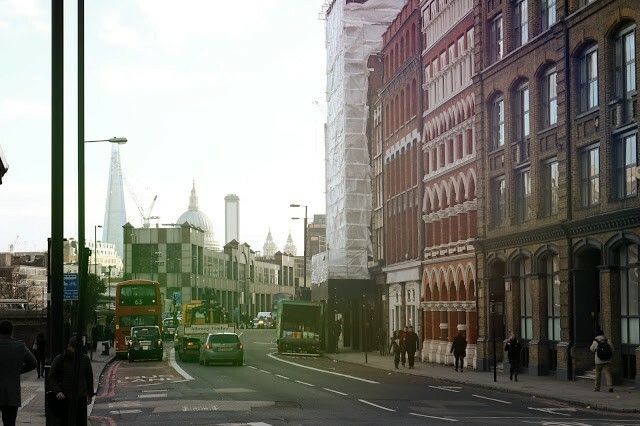 As you walk down Farringdon Road, take a detour down St Andrew Street. Don't forget to look up, from the trees across the road to the clock tower, as Bill Sikes instructs Oliver to do in the books. Another side street to look out for is Ray Street; this is where the pub 'The Coach and Horses' stands and it belongs to the area Oliver refers to as 'Hockley-In-The-Hole'. By the 1700s, this whole area was a notorious slum that sat on the dirtiest stretch of the Fleet River, know as the Fleet Ditch. It got its nickname from its proximity to a malodorous open sewer and its boastful claim to the capital's highest murder rate. Stopping at the junction between Clerkenwell Road, Farringdon Lane and Turnmill Road, you can still feel the hidden Fleet River running beneath your feet. The epicentre of The Fleet Ditch Victorian rookeries was Turnmill street, still standing today. Conditions were so appalling, this road was known by locals as "Little Hell". In between the counterfeiters, pickpockets and women trying to steal the clothes of unsuspecting children, one thing Turnmill Street always has been able to boast about is a stunning view of St Paul's Cathedral. It was there that Dickens attended the funeral of the Duke of Wellington, and, finding the event to be so ostentatious, he vowed then and there that his own funeral would be a much quieter affair. One of the most famous rookeries in this area was Herbal Hill. It got its name from its beginnings in the medieval ages, when Saffron was actually grown there, and used to hide the taste of bad meat. In the 13th Century, almost the whole area was owned by the estate of John Kirkby, who built the original Chapel of St Etheldreda and later became the Bishop of Ely; hence the ornate gates at Ely Place. By the Victorian ages, Herbal Hill was one of London's worst slums. Nearby is Saffron Hill. This is the street that Field Lane was incorporated into in the early 19th Century. Field Lane, which once sat on what is now the junction near Shoe Lane and Charterhouse Street. It was one of London's most established rookeries and slums, known best for the resale of stolen handkerchiefs. This is where the site of Fagin's Lair is most accepted to be. 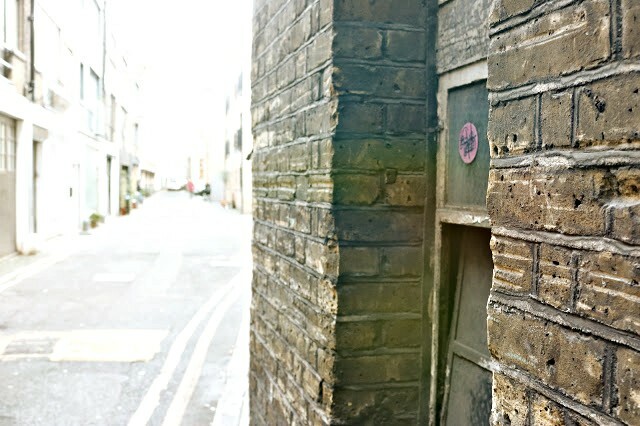 It was also the site of the very real Mother Clap's Molly House - a 'coffeehouse' and possible brothel where gay men could meet in secrecy and safety. It was raided in 1726, and Margaret 'Mother' Molly Clap was sentenced to three days in the Smithfield Pillory, the site of which can now be found on the junction between West Smithfield and East Poultry Avenue. Margaret was also sentenced to two years in jail, but she never made it; she died of injuries sustained in the pillory. To this day, she is considered an incredibly important part of the LGBT subculture in Georgian London. 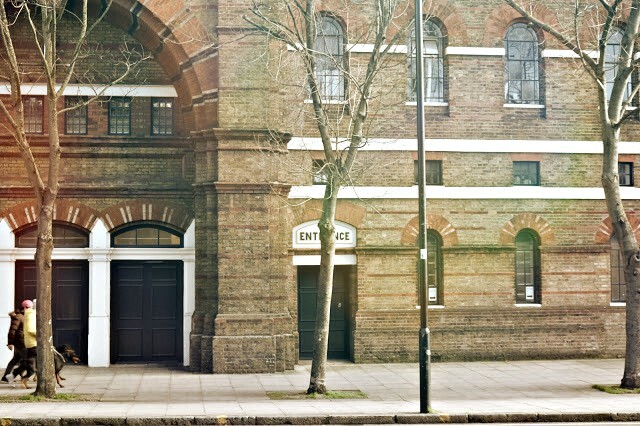 in 1841, a 'ragged' school was set up on Saffron Hill to teach children and young people the Christian Gospel. Charles Dickens visited in 1843, and was so powerfully struck by the horrors he witnessed that it spurred him to want to do something for the 'Poor Man's Child'. Children in this school would have been thieves, prostitutes, unwashed and mostly illiterate. The smell was so bad that his assistant had to leave the school, but Dickens stayed and was teased by students for his posh clothes and 'fashionable' hairstyle. He wrote about the West Lane/Saffron Hill 'Ragged' School in his non-fiction writing and was very aware of the area and its history. It's no surprise that it became such an important part of Oliver Twist's story too. The organisation now exists, albeit very differently, as the Field Lane Foundation. 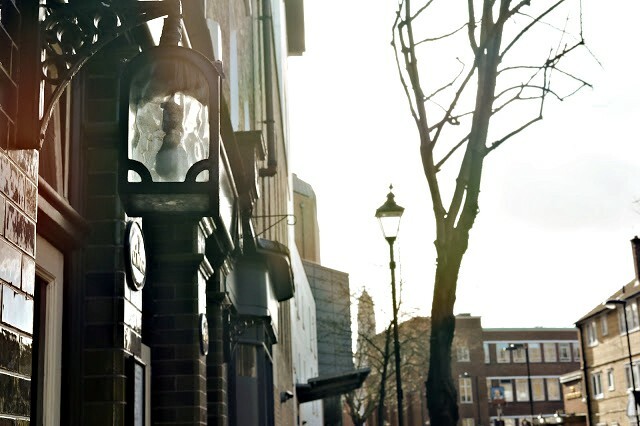 Another long-standing piece of history on Saffron Hill is the One Tun Pub. 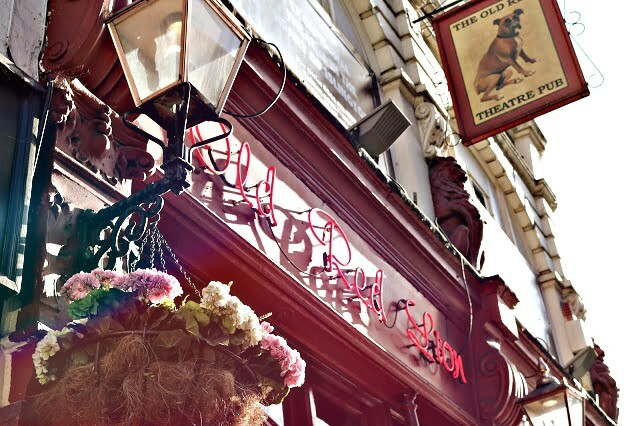 Rebuilt in 1875, it claims to have on been the 'Three Cripples'; the tavern featured in Oliver Twist, where Fagin and Bill Sikes are noted as regular haunts. Moving forward towards the city, we next come across Pear Tree Court. This is thought to be the "narrow court" from which Dodger, Charley and Oliver emerge onto Clerkenwell Green and conspire to pick Mr Bronlow's pocket. 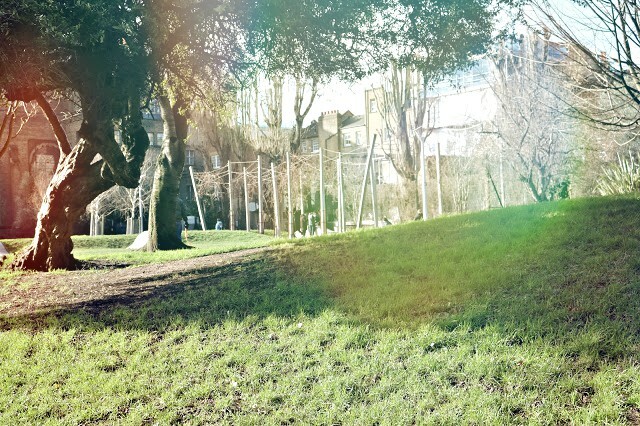 Clerkenwell Green is notable for its lack of greenery; something Oliver himself comments on in the book. It also houses the still-standing Old Session House; the destination that Mr Bumble boasts to be bound at the beginning of the book. 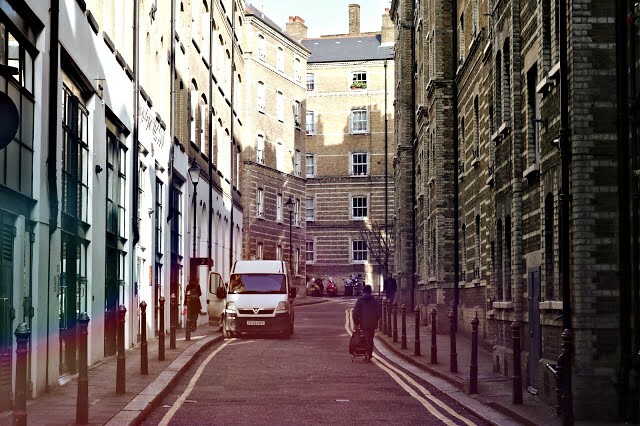 From Clerkenwell Green, go back down CLerkenweel Road, down Ray Street, up Herbal and then Saffron Hill and then down Hatton Wall to 54 Hatton Place. This is the route down which Oliver is chased after being accused of stealing from the man at the bookshop on the 'green'. 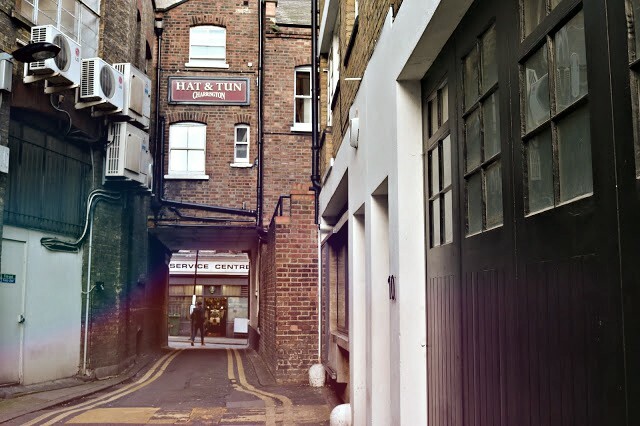 Number 54, a building with bricked up walls and a grey gate, was once the front entrance to Hatton Garden Police-Court, the 'notorious' police office where Oliver is then taken. Another local celebrity of this area was the magistrate, A.S. Laing, who was so well known for being harsh and insolent that, when writing Oliver Twist, Dickens wrote to a friend and asked to be smuggled in one morning in order to meet the man. This is the very real life character that the fictional magistrate, Mr. Fang, is inspired by, and whom Oliver meets when taken to court. The area also makes an appearance in Bleak House, where Mr. Jellyby escapes his wife's 'philanthropic' ways to go for a walk. Just a small walk away is The Old Bailey. This was the site of the infamous Newgate Prison where Fagin spent his last years before being executed and where, in the novel Great Expectations, Magwitch learns that (155-Year Old Spoiler Coming Up) Estella is his biological daughter. It is also where Charles Darney is tried in A Tale of Two Cities, and where (157- Year Old Spoiler) Sydney Carton takes his place to be executed. The Prison was burnt down during a 1780 riot and rebuilt many times. It was later demolished, and when the 'Old Bailey' was built in its place in 1902 it used some of the Newgate Prison bricks. The trek to our final destination is quite a walk, but before we set off, don't forget to make note of the St Sepulchre's Church, which sits almost opposite The Old Bailey. This church is noted by the narrator in Oliver Twist, as it is where bells would ring out at 8am if an execution was to take place that day. Public Hangings were moved to the Newgate area in 1758 but, before that, criminals would be walked out of the Prison and past this church on their way to the infamous Tyburn Tree, where executions were carried out for almost 600 years. 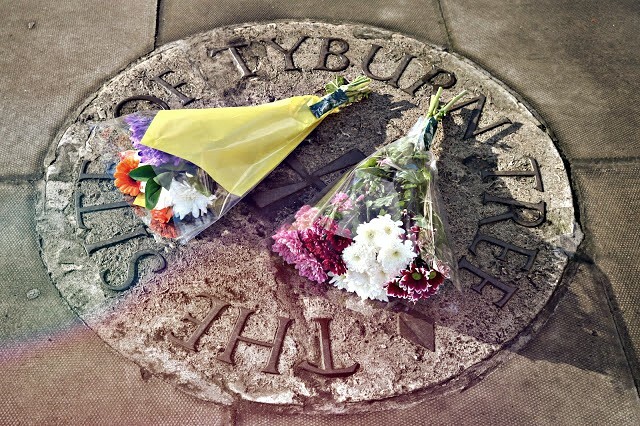 The site of Tyburn can be found next to Marble Arch, the historically significant junction where Edgeware meets Bayswater Road. Today, nothing marks the spot where innumerable people were killed but an easily-missed plaque in the middle of a busy crossing, cars and pedestrians zooming past. When I was walking across Tower Bridge with my great-uncle a few weeks before, it was Shad Thames he had pointed out to me. At the end of 24 hours, I ended up back on the Bridge, watching the sunset over the unfamiliar little square of London. 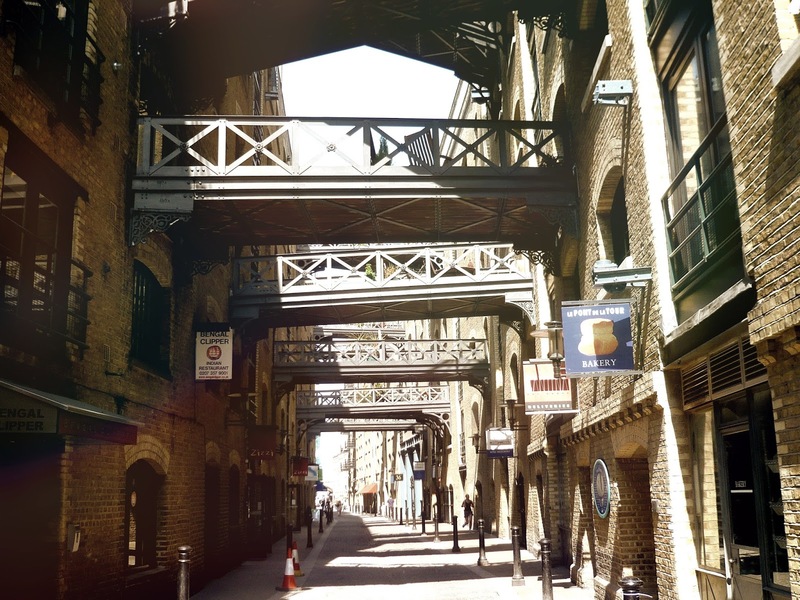 In the Victorian Era, the Shad Thames area (also known as Butler's Wharf) was mostly home to factories. Most of the buildings still remain beautifully intact, and this no doubt influenced the decision of Hollywood producers to film the now iconic Oliver Twist movie here. Visually, this is the place most know as Fagin's Lair. Just to the West, though, was an area Dickens was very familiar with; Jacob's Island. This was the site of another notorious rookery. It is no coincidence that this is where Dickens placed his most notorious nasty character; Bill Sykes. Since the Edwardian era, it's been widely acknowledged that the site of literature's most famous crook's very own home can still be visited in George's Yard. Jacob's Island now bears no resemblance to the squalor many once lived in there, and Shad Thames is one of the trendiest areas in the City. Once named the "very capital of Cholera", all that separated the two areas was St Saviour's Dock. This is where Bill Sykes met his gruesome end; falling into the mud of the infamous 'Folly Ditch'. And here, we conclude our tour of Dickensian London. I hoped you enjoyed the ride as much as I did. In just 24 hours, you can discover a wealth of history on the street of London, if only you know where to look.